Testing of dynamic web sites and applications often requires the usage of dynamic values of request parameters. If you do not change the recorded user profiles, WAPT Pro simply repeats all requests that you made during recording, so all virtual users of the same profile send identical requests to the server. However, you can add more reality to your tests by using parameter values generated dynamically at run-time. WAPT Pro can simulate this with the help of various functions. The program provides you with a number of functions for dynamic calculation of request parameters and URL paths at run-time. The results of several functions can be also concatenated to form more complicated values. WAPT Pro can also upload files to web server using the POST method with multipart content. You can define a variable (using functions or other variables) and set a request parameter to use the value. HTML code of the CURRENT page when the function is used for defining a VARIABLE. The list of request parameters is displayed in request properties (URL Parameters or POST Parameters tab). To define a parameter, you can use functions that parse actual HTML code of response at run-time. 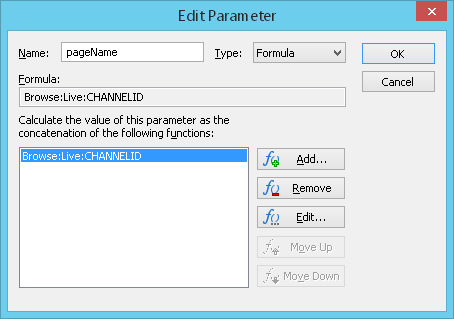 Add..: Opens the Add Parameter dialog where you can create a new parameter and select a function for its calculation. Edit..: Opens the Edit Parameter dialog where you can change parameter name and a function for its calculation. Name: Here you can change parameter name. Type: You can select "Formula", "File" or "No Value". Formula: Use this option if you wish to select some function for calculation of parameter value. File: Use this option if you need to upload some file (for example, an image file) to the tested server. For details, see the description of $File function. No Value: Use this option if you need to define a parameter without value. The following is related to the option Formula. Formula: Here you can see the visual representation of selected function. This field is accessible only for viewing. Functions: The list of functions for calculation of the current parameter is displayed in this field. You can define several functions for the same parameter. Results of those functions will be concatenated to form more complicated values. Add..: Opens the Add Function dialog where you can select a function for calculation of parameter value. Edit..: Opens the Edit Function dialog where you can edit the selected function or choose another function. Move Up: Moves selected function one step up in the list (if you defined several functions for the same parameter). Move Down: Moves selected function one step down in the list. 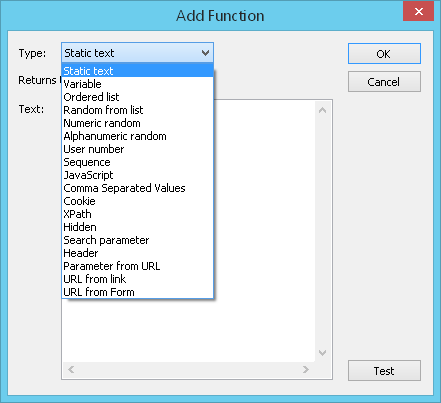 You can test the work of any function by clicking the Test button in the dialog with the function properties. You will see the function value calculated using the recorded server response. If the function is executed with an error, you will additionally see the corresponding error message.